This publication is part of report series published under the FAO Investment Centre/European Bank for Reconstruction and Development Cooperation Programme. The series presents sector reviews and studies undertaken in Central and Eastern Europe that cover development issues and innovative areas to increase investment in agriculture in the region. Warehouse receipts are used to facilitate the financing of primary agriculture, agricultural trade and food processing. Like other countries of the region, agricultural enterprises in Lithuania are facing difficulties in raising working capital. In this context, EBRD decided to promote the development of a grain warehouse receipt programme in Lithuania, as part of its support to the utilization of warehouse receipts as collateral for financing throughout the region. 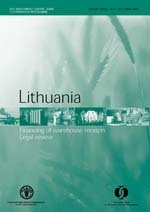 This publication focuses on the legal issues that need to be addressed in order to set up a functioning warehouse receipts system in Lithuania. The report is a reference for governments interested in setting up similar systems throughout the region.